Pork | Let There Be Food! Happy New Years Greetings my foodie friends! I hope the new year is treating you all well, and if you have made new year’s resolutions that you have had good luck in keeping them so far. Mostly, I don’t make resolutions in the traditional sense. However, I have made a one word resolution this year so I am excited to see how that unfolds. In the food realm, I’m aiming to learn to make black bean burgers and to practice using my slow cooker more. I don’t really feel like those are resolutions but “to do” list items. What about you? What are you hoping to do this year? 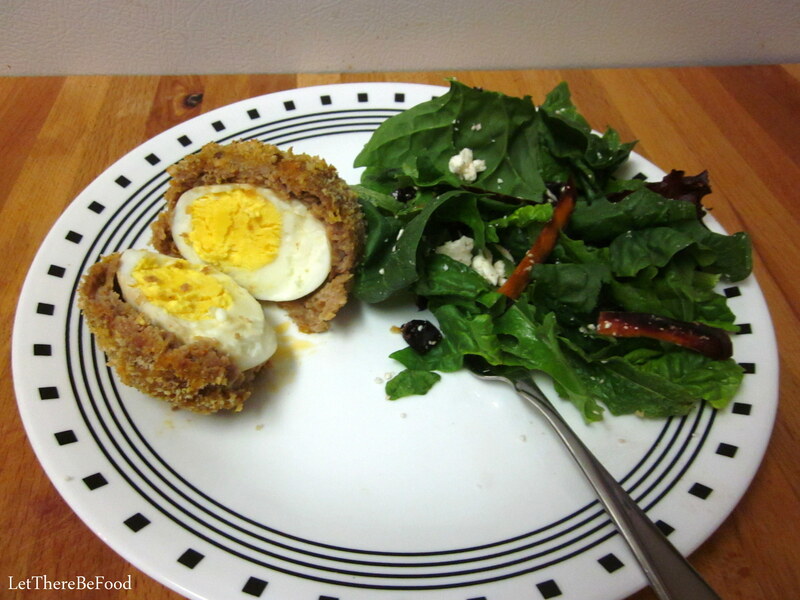 I’m excited to bring you my recipe for Baked Scotch Eggs to kick off the New Year! I’ve been sitting on this recipe for a while now, and I have no good reason for not sharing sooner. Please forgive me. This is a simple recipe, requiring few ingredients, that makes a fancy-feeling dinner, or an elegant breakfast. You can make this to impress just about anyone who digs on eggs and sausage. I have a little trick for you if you want to up the ante, it will knock the socks off anyone eating with you, and only you will know it was easy-peasy. That’s the best kind of trick, isn’t it?! 1. Cook your eggs with your preferred hard-boil method. 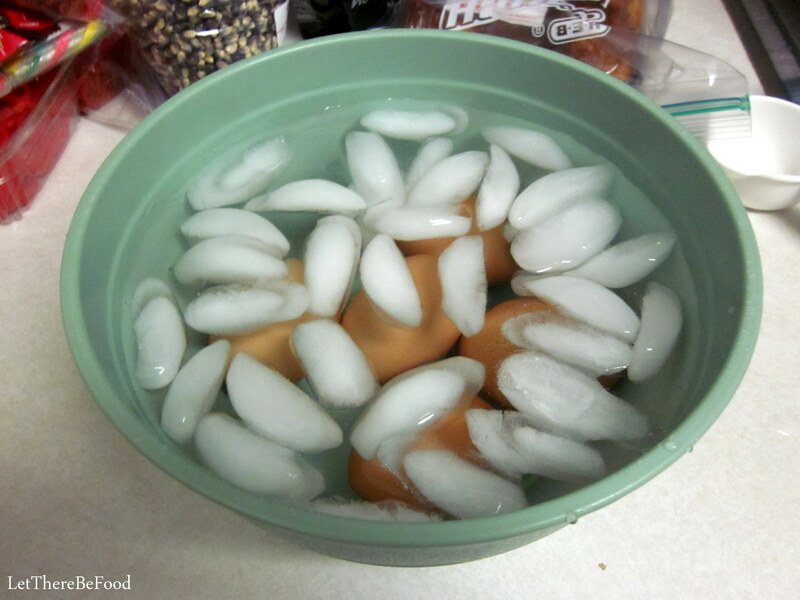 I put eggs in a pan with cold water, then bring to a boil, and take off the heat for 7 minutes. Carefully transfer from the hot water into an ice bath, and let sit for 10 minutes before peeling. 2. Preheat your oven to 400 degrees Fahrenheit (204.4 degrees Celsius). Line a jelly-roll pan with foil and put a cooling rack on it. Spray with non-stick spray. 3. Divide your sausage into 5 equal portions. If you have a scale, you are looking for 5 1/8 ounces (145.3 grams) per portion. 4. Take a peeled egg, roll it in the flour, and then shake off the excess. You want just a thin coating to help the sausage stick to the egg. 5. 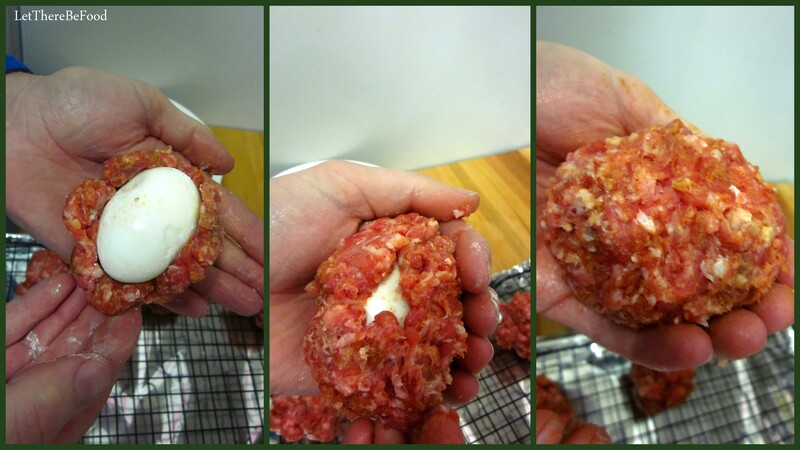 Very carefully, take the sausage portion and shape it around the egg. When you close it up, be sure to smooth the seam of the sausage over. (It may feel a bit like a middle school clay project!) Repeat for each egg. 6. 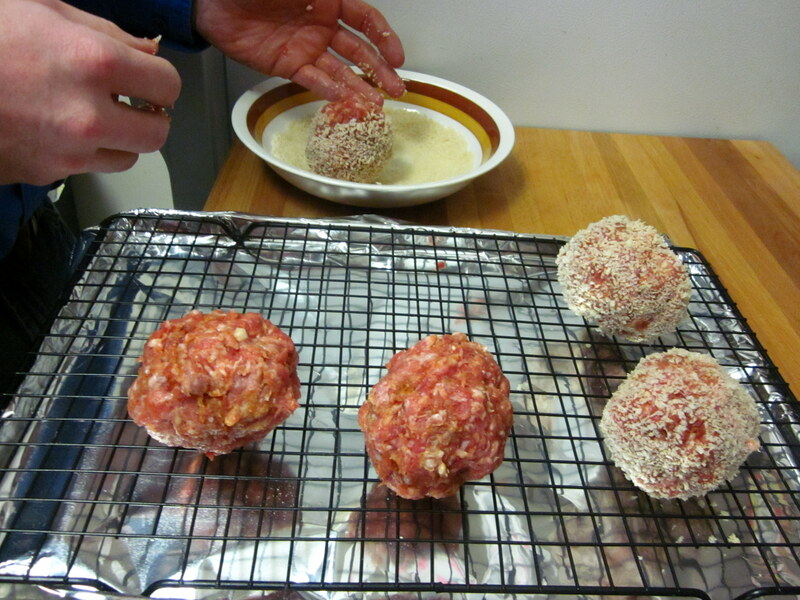 Roll your sausage balls in the Panko to coat. *** Place on the cooling rack. 7. 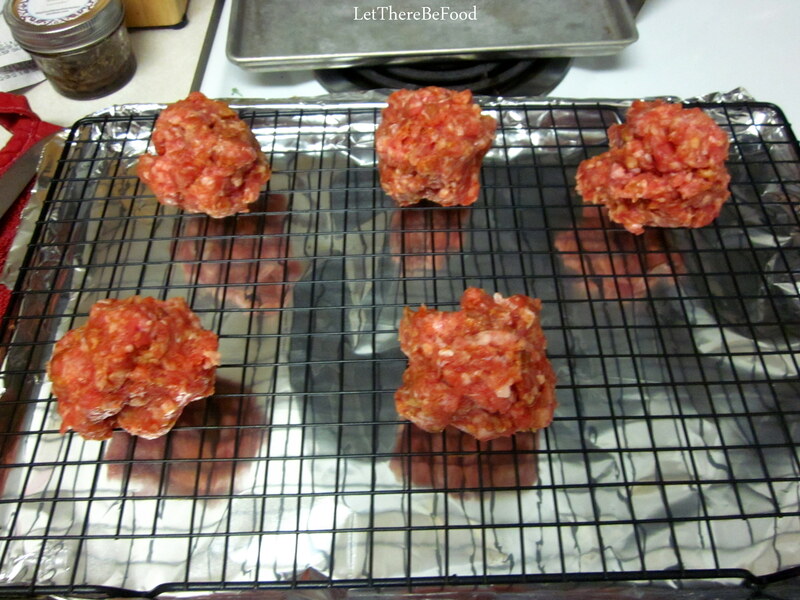 Put in the oven for 20 – 25 minutes. You want to make sure the sausage is no longer pink. * Tip – If you wish to impress folks, you can make your own breakfast sausage. I promise you, it is not hard at all. Here’s how you do it. – Mix it up with your hands and then use! See how easy that was!! It takes an extra couple of minutes, but you can tell everyone that you made your own sausage, and they’ll be totally wowed. Do it! ** Here is a post that explains Panko breadcrumbs in detail in case this is your first time to be exposed to them. It’s worth the switch from regular breadcrumbs to Panko; I promise. ***My personal recommendation is to only put the Panko breadcrumbs on the eggs you plan on eating that meal. These make lovely leftovers, but the Panko doesn’t reheat well so if you know you’ll save two of them for lunch the following day, then skip the breadcrumbs on those two. Depending on your sausage approach, if you were using my dad’s good friend, Jimmy Dean, there are lots of flavor varieties that could spice up your eggs. If you are making your own, I think you can trust your own palate to know when and how to add more heat or flavors as you prefer. Trust your judgment. It is your kitchen, after all. The aroma as these bake is heavenly. It makes me think of a weekend morning, even on a Thursday night. The layer of sausage around the eggs keeps them from overcooking which means the eggs come out soft and tender, wrapped inside a blanket of spicy sausage goodness. 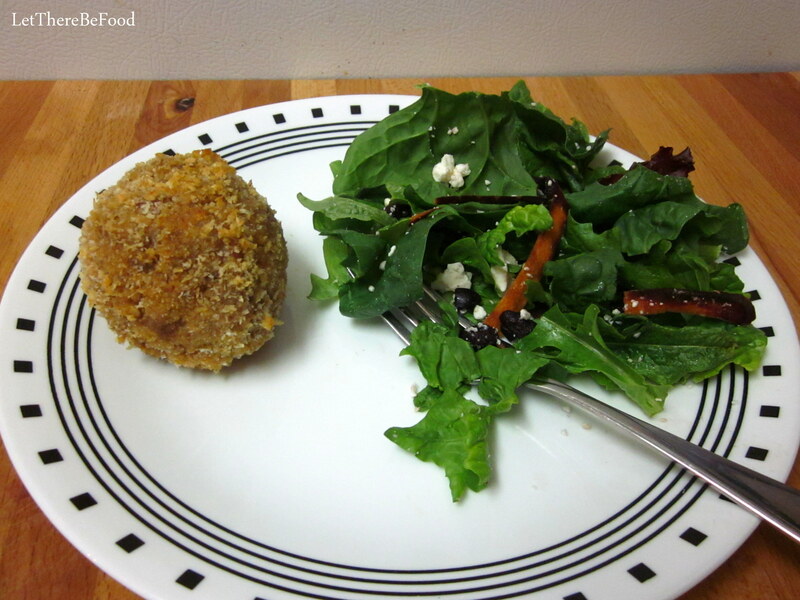 My preferred meal is to pair the Scotch Eggs with a salad or some steamed broccoli and carrot sticks to make sure that I get in my veggies. For leftovers, you could slice up the egg between some hearty bread for a breakfast sandwich that I am sure would be divine. As there are only a few ingredients in this recipe, I do encourage you to use the best ones you can find. My preference is to use eggs from one of my favorite vendors at the nearby farmer’s market, ground pork from Richardson Farms (also from the farmer’s market), and the breakfast sausage spice blend from Penzey’s. I like feeling connected to the people who grow/produce the items I buy, and I believe that the quality of my food is higher. Plus, knowing the sources of my food makes the meal more special for the boyfriend and me because we can go back and share with the vendors what we made with the items we bought. That’s always fun to do. One final note: sometimes shaping the sausage is tricky. You think you’ve gotten it all smoothed out. 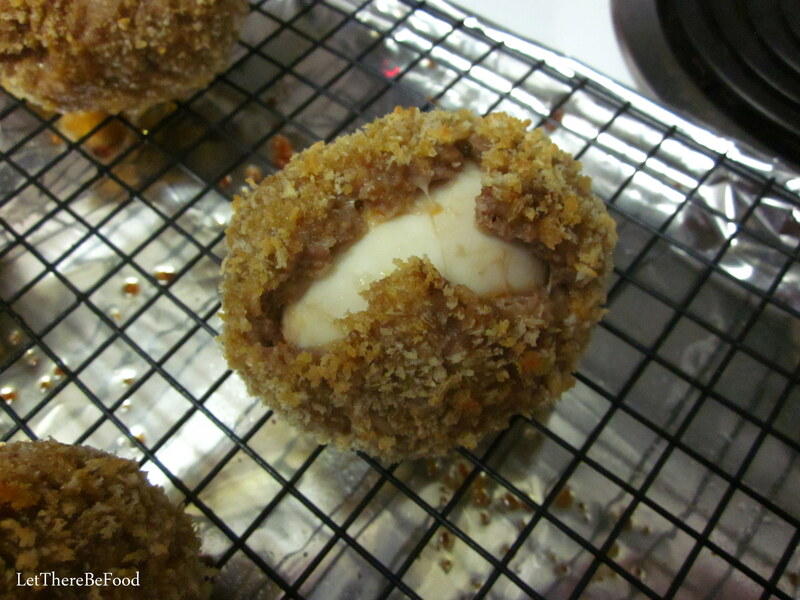 You believe the seam is meshed together well, and then your scotch egg comes out of the oven looking like this. Well, my friends, don’t despair. I assure you, it’s still edible, and your egg is still fine. It’s just a great reason to try again next week. After all, practice makes perfect, yes? I just want you to know you aren’t alone when this happens. Dig in, and happy eating!